Wooden dinosaur shaped mobile drying rack, ideal for use in schools, pre-schools and nurseries. Adds an organised and look to any classroom in a fun, child-friendly way. 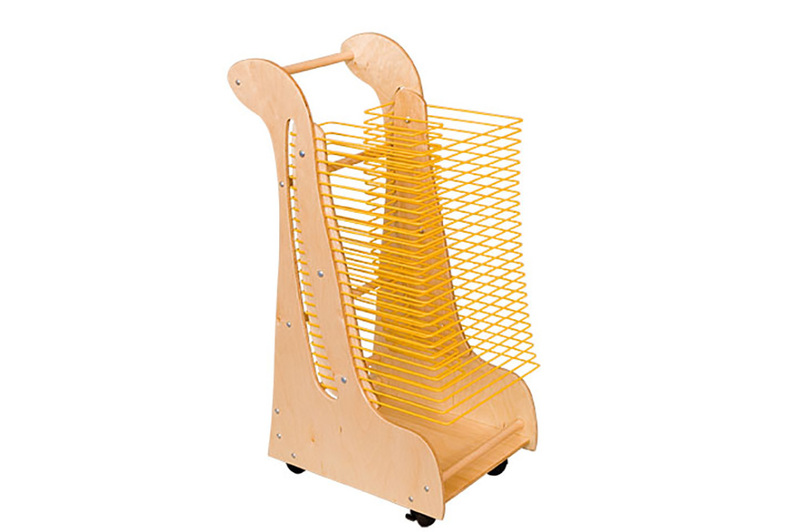 This classroom drying rack comes with 25 drying racks which are evenly spaced and suitable for A4 sized paper. The unique dinosaur shape is a fun design and adds character to any classroom art corner. The art drying rack allows you to dry multiple pieces of artwork simultaneously without crowding tables, easels and windowsills around the classroom. It also provides a level of protection so artwork doesn’t get damaged or mixed up during the drying process. The metal shelves are plastic coated and come in a yellow finish. Fully adjustable, all shelves can be removed for easy cleaning. Reposition the drying shelves to increase gaps between shelves for different sized projects which may require a larger depth or height. Manufactured from birch-plywood with a beech finish, the drying rack is durable, hard-wearing, and easy to clean. The child-friendly design is complete with rounded corners for increased safety. At the bottom of the drying rack, there is a shelf to prevent any leaks or drips from staining the floor. Alternatively, use this shelf for storing art supplies or dried artwork. The unit comes with 4 easy-glide, locking castors which allow for easy movement between classrooms. This drying rack also comes with a handle rail to aid transporting the unit. With 25 racks each holding prints up to an A4 size, the drying rack frees up valuable classroom space and is great for minimising mess in a classroom. Each shelf has a maximum load bearing weight of 2kg’s. Evenly spaced racks allows work to dry quicker because there is airflow to the top and bottom of prints. This drying rack has undergone rigorous testing to ensure it is safe for use around children and fully conforms to BS EN 71 parts 1, 2 and 3. If you require any further information on the Dinosaur Drying Rack, please contact us or call our sales team on 01733 511 121. Dimensions: 910mm (h) x 360mm (w) x 510mm (d).